When Matthew’s three children spent time with them, many times they were disrespectful to Rebecca and Matthew never stepped-in and asked them to be more courteous to the woman he loved. She tried her hardest to treat them with generosity and kindness, but that left her feeling alone and unsupported in the relationship when this would happen. You’re overreacting; she’s the mother of my children. It’s totally normal that we would spend time together and besides, the kids have expressed that they like it when their mom and dad spend time together with them as a family. If you don’t like the way my kids speak to you, then you should let them know that; I don’t want to get in the middle of it and they’re just being kids. But she did love him and she genuinely thought she could ultimately make it work. She also believed that he loved her, even though sometimes that love hurt. Rebecca thought maybe someday, maybe as their relationship grew closer, these concerns would change. But they never did; as a matter of fact, the concerns only became increasingly troubling over the years. But, she had been allowing it. She had overlooked the relationship he was continuing to have with his ex, not asking questions because she didn’t really want to hear the answers. She allowed his kids to be disrespectful to her, because she didn’t want to cause waves and she wanted them to like her. She accommodated his excuses and she ignored her gut. Fortunately, once she realized that, she no longer felt powerless to either create the changes she wanted to see in their relationship or be able to move on from the relationship. She was no longer stuck as the victim, wanting more but not really sure how to get it. Once she stopped allowing the people around her to treat her poorly, the answers for her life became very clear. And as always happens, the minute she stopped lying to herself, telling herself that crumbs were enough when she knew they weren’t, the truth became undeniable. 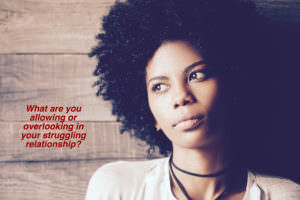 Is there something you’ve been allowing or overlooking in your relationship? Are you struggling setting healthy boundaries and teaching people to treat you with respect? Trying to figure out if your relationship can feel good again or if it’s time to acknowledge its expiration date?